A new $22 million initiative will link law enforcement and mental health professionals to better handle mentally unwell people who are also violent, Mayor Bill de Blasio said Thursday. His wife, first lady Chirlane McCray, is leading a larger effort of changing how the city addresses mental illness. CITY HALL — A new $22 million initiative will link law enforcement and mental health professionals to better handle mentally unwell people who are also violent, city officials said Thursday. The effort, NYC Safe, is part of a larger strategy, led by first lady Chirlane McCray, of changing how the city addresses mental illness. "What we are talking about is unprecedented — a culture shift in the way we think about and treat people who suffer from serious mental illness who are also violent," McCray said at City Hall. "That shift recognizes a fundamental truth: most people who suffer from mental illness are not violent, but those who are, have an outsized impact on the lives of their loved ones, families and the communities in which they live." Under the plan, the city will create a central hub to be managed by the Mayor's Office of Criminal Justice that will better identify those mentally ill individuals who are prone to violence and connect them with much-needed services. The hub will coordinate with police and the city's Department of Homeless Services to try to intervene in real time. A new monitoring team will be put in place at the Department of Health to find treatment options for mentally ill residents who are most likely to commit violence. City officials said that only a couple hundred people in the city fall into the category of being mentally ill and prone to violence. Since there are approximately 3,000 homeless people living on city streets, Mayor Bill de Blasio disputed the notion that the homeless comprise the majority of the violent, mentally ill population. "If you think about some of the most troubling cases that happened this year, where someone was of harm to themselves or someone else, a lot of those people lived in stable housing," de Blasio said. 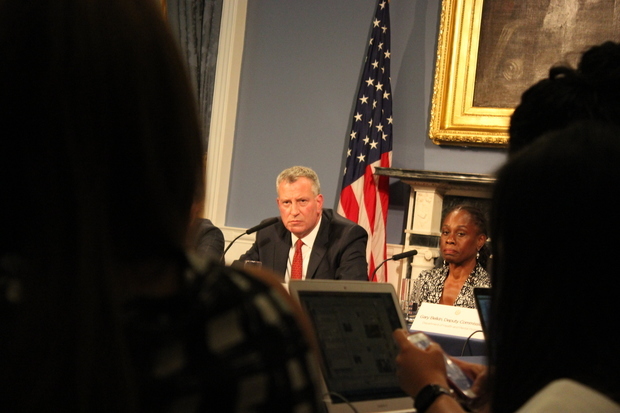 The plan comes as de Blasio is battling the perception that there are more homeless people roaming the city's streets. According to a Quinnipiac University Poll, 53 percent of voters disagree with the way de Blasio is handling the issues of poverty and homelessness. The city is also training five special teams made up of police officers and mental health providers from the Health Department to respond to situations. Additional outreach includes a total of seven teams who will be out interacting with people with mental illness and providing treatment in the city's neighborhoods. "Many of these New Yorkers shuttle through the criminal justice system or the shelter system or psychiatric emergency rooms or end up on the street. In each of these instances, they end up anywhere but where they need to be most, which is in treatment," de Blasio said. "So, so many of these New Yorkers are falling through the cracks. And that means that tragedy could be around the corner," added the mayor. De Blasio backed off of the idea widely reported in the media this week that the initiative was designed to address homelessness. "Some in the media have tried to portray this as about [the] homeless first and foremost. No. It is about people who have mental health challenges and are prone to violence. They are a concern to all of us, whether they live in an apartment building, a private home, a shelter, or on the street," said the mayor. But many aspects of the plan deals with homelessness, including adding more staff and peace officers at the city's homeless shelters. The Department of Homeless Services will also play a role in the central hub the city is creating. Gilbert Taylor, commissioner of DHS, said the plan will help him provide better care to the homeless who are mentally ill and in shelters. Staffers will be added to help make the shelters safer, hopefully enticing more homeless New Yorkers to enter the system where they can receive treatment, officials said. "The power of the clinical services will be hugely, hugely important for the population of clients that we’re working with," Taylor said.